A year after a rare procedure at the University of Florida Large Animal Hospital and support from an internal fund tapped to assist in certain hardship cases, a miniature horse named Rico is thriving and back to his normal routine. Although it was unclear what had caused Rico’s injury, trauma of some kind was suspected, McCarrel said. 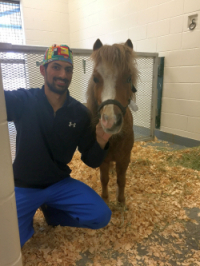 “The only horse that might have a surgical option would be a mini, so he had an opportunity that another horse might not have had, as surgery would just be too difficult,” Miller said. A larger horse’s weight would make even obtaining a diagnosis problematic, but she was able to get “pretty good” images of Rico’s leg, she said, aiding in his diagnosis. The drain was removed several days later and Rico’s incision healed without complication. Rico went home approximately one week after his surgery, which was conducted April 6, 2017, with instructions for his owners to conduct physical therapy on him daily. “He’s just my little angel,” she added.